In the winter time, we find almost everyone around sniffing, sneezing and coughing. Changing of the seasons is the time when our immune system is trying to adjust and the body is most vulnerable to infections. At such a time, diet is of the utmost importance. 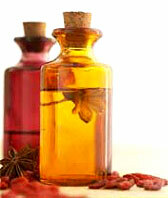 Why resort to cough syrups and medications when Nature has given us food substances with naturally warm properties? Ginger tea is great to prevent and cure common cold. When added to your food it gives great flavour and aroma. 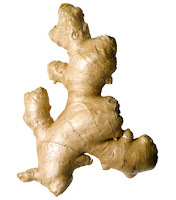 Ginger can even be applied on the body to soothe aching joints and muscles. It helps fight infections, boosts immunity, is used in hot formentation in arthtitis, gout, oedema and other forms of joint and muscle pain. It provides relief from respiratory disorders like cough, cold, pneumonia, asthma, bronchitis etc. A powder of dry ginger mixed with sesame oil and massaged on the joint provides relief. Dried ginger powder made into a paste with warm water can be applied on the forehead, cheek bone area and nose to help melt congested sinuses. However, it can bring out skin reactions in those with sensitive skin so use with care. This is my favourite remedy. Tulsi or Holy Basil is easily grown in the garden or balcony. This holy plant is anti-asthmatic and anti-infective. It increases respiratory resistance. It helps in instant relief from cough and one can even put 3-4 Tulsi leaves in the jugs of drinking water. Tulsi juice made by pounding its leaves with a few drops of ginger and honey helps strengthen immunity. Also, do try and spend some time sunbathing in the warm soothing rays of the morning or evening sun. These little things when put in practice go a long way in preserving one's health. Remember, Nature's wonders are always at our disposal. 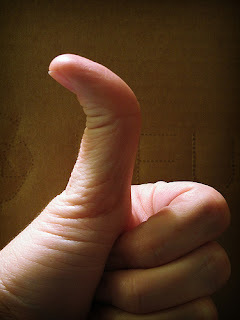 However, I would not recommend self-diagnosis in severe cases. Always consult a physician or medical authority in case the matter is more than just a slight cough or cold. Body-Mind Therapist and Trainer, Reiki Practitioner and Naturopath. Reiki is fast becoming a popular healing therapy. As awareness of alternative therapies increases, people are resorting to this amazing energy healing technique. Reiki, in Japanese means Universal Life-force Energy. Some form or other of energy healing has been practiced since ancient times. There are many stories of healing powers of Saints and Yogis. 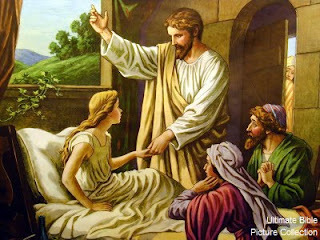 There are also stories of Jesus Christ healing people, in the Bible. However, one can say that this secret to healing was rediscovered by Dr. Mikao Usui in Japan. Passed on from person to person, this knowledge and ability to heal has been spread to many practitioners today over the world. There is a very powerful, positive healing energy in the Universe. An attuned practitioner of Reiki becomes a channel for this energy to flow through them, to the patient/ client via their hands. This energy is sent to every Chakra (Energy Centre) of the body. It is said that most diseases and imbalances in the body are due to blockages in the energy flow of the body. This is also explained in Yoga when talking about Pranayama. In Yoga, Prana is the bio-energy that is responsible for functioning of the body. Through Pranayama, this energy is channelled correctly and harnessed, and that leads to longer lifespan and good physical and mental health. In the same way, Reiki is that positive life-force energy that flows into the body, healing you, removing your toxins and opening up the channels. Many people find the concept of Reiki strange and unbelievable, but after a therapy session, I have found many people raise their eyebrows incredulously and claiming that, “It really worked!” To those who doubt Reiki, I’d just say, try not to judge something without knowing about/ trying it properly. A typical therapy session would involve clearing negative energies from the room first. Then the client lies on the back, relaxed, with eyes closed. The therapist starts from the head, spends some time on each chakra and moves down to the feet. Then the same is done with the client lying face down. 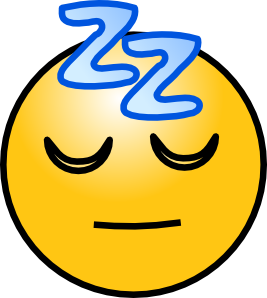 It is possible that the client may fall asleep during the session, which is quite common and it does not affect the healing. 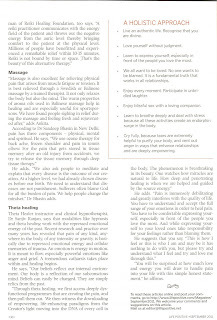 Reiki can be used for local healing eg. small cuts and wounds, and can even be sent over a distance eg. the practitioner from his/ her own home can send it to the client who is at his/ her home. Reiki is a very safe technique. It has been found to help cure almost all problems under the sun, including physical, psychological, emotional and spiritual. There is still a lot to discover when it comes to the potential of Reiki in healing. 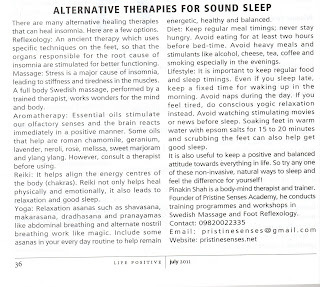 It has been found useful in curing sleeplessness, breathing problems, stress, pain, swellings, emotional and past issues, etc. to name just a few. Of course, a note of caution, it does not mean that you do not take medical treatments if your body requires it. It has almost no side effects. 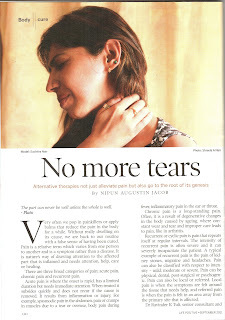 However, some people experience a little increase of pain/ problem before they are healed. This is because Reiki leads to removal of toxins in the natural way. So, the body tries to remove through the usual methods – urine, cold, cough, faeces, sweat and even some emotional release like crying. These all differ from person to person and don’t necessarily occur. During Reiki, one generally feels warm in the part being healed. In my experience, there have been many people who feel vibrations, waves, tingling sensation and even cold. Some even claim to have seen some visions. They feel relaxed and positive after the session and sometimes in just the first session or after regular healing sessions, see a marked improvement in their condition. So if you’re looking for a natural way of healing, do try Reiki. You may be surprised, like many others before you. 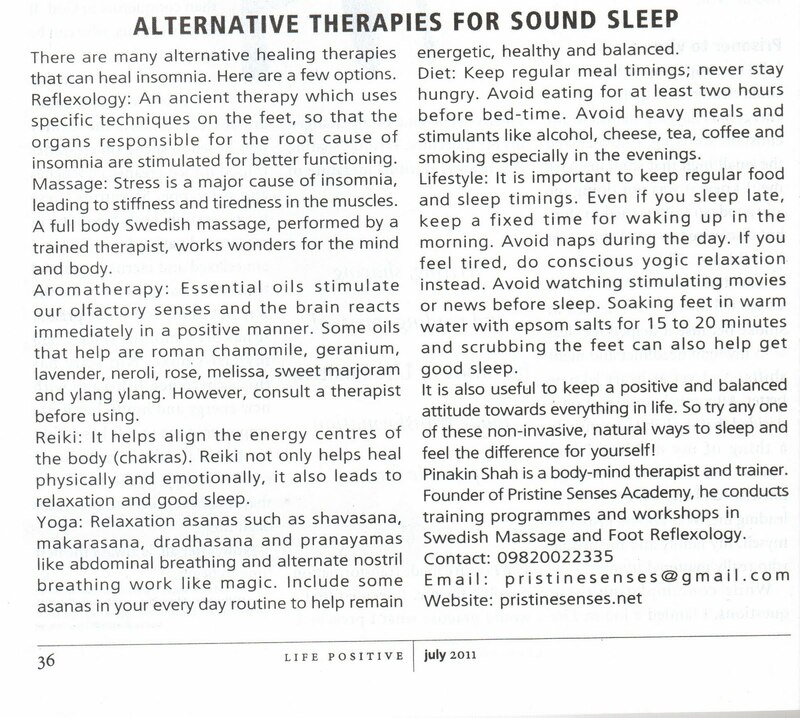 Learn Alternative Therapies for hobby or profession !! 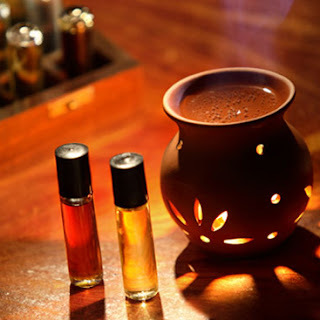 These days we find many foot spas coming up in every nook and cranny of Mumbai. It is evident that foot massage is becoming very popular among the masses in urban India. However the question that arises is; is there any foot spa that is completely unique? Unfortunately, all foot spas are cashing in on the same theme, a mix of Thai foot massage with head, shoulder, hand massage and a bit of reflexology, generally done with a tool. If a prospective client enquires and asks whether Reflexology treatment is available, they are told it is. But what they actually get is quite different from traditional reflexology. · In traditional reflexology, oil or cream is not used as it makes the thumb or fingers slip, preventing the therapist from stimulating each point properly. Instead, a bit of talc powder is used. 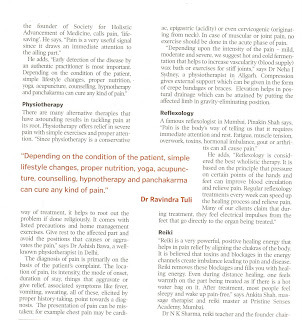 · It is not recommended to use any instruments in reflexology unlike what is done in most of the current spas. Fingers and Thumbs are the best tools for reflexology as they help the therapist to feel any possible knots or tenderness in the feet. · A few massage techniques are used during reflexology for warming up the feet and relaxing the client. However, these techniques are used only as a starter, a bit in the middle and as dessert during treatment. The actual treatment mainly involves thumb/ finger walking, pivoting and finger rotary pressure. It is sad that a traditional reflexology spa/ clinic is still difficult to find in a city like Mumbai where almost every single person requires a healing treatment for their stress, tension and the resultant diseases. Most spa owners believe that there will be more ROI if they offer the ‘popular’ treatments, but the market soon gets saturated with the same kind of services. What we need to realize is that popularity can be created by using the right kind of marketing techniques. And the best bet for survival of any spa is to offer something unique and niche. Have you noticed that when we are disturbed and thinking a lot, our eyes keep moving around unfocussed and hazy? When we are anxious, we tend to hold our breath. When we are relieved, we exhale slow and long. When we are angry and disagree with someone, our body becomes rigid and closed. The close connection of body and mind should not come as a surprise. The mind was made to control every part of the body, being the headquarters. The body was made to work well and send warning signals to the mind in case of anything going wrong. However, we are so immersed in the outside material world, busy making money, partying, indulging in tasty food and drink and other temptations to our senses, that we have forgotten the real reason that our body and mind exist for. When we focus our mind on too many things and negativity, instead of on taking care of the body and then keep the body busy with all kinds of garbage dumped in it, instead of letting it function naturally, things slowly go awry. The mind and body are connected through a unique wiring of nerves. And the energy to ‘act’ is transferred through energy channels called meridians. When we abuse the mind and body, problems occur in their connection. Toxins and impurities block the channels and body and mind begin to suffer through gradual suffocation due to lack of nutrients and energy. What results is an expected tirade of physical, psychological and emotional diseases. There are a few options getting out of this trap. Chemicals in the form of medicines can be resorted to, Ayurveda provides many solutions and along with alternative therapies, we have a chance to heal. Alternative therapies like Foot Reflexology, Massage, Aromatherapy, Reiki, Scrubs and Wraps help in removing the blockages and in clearing up energy channels. 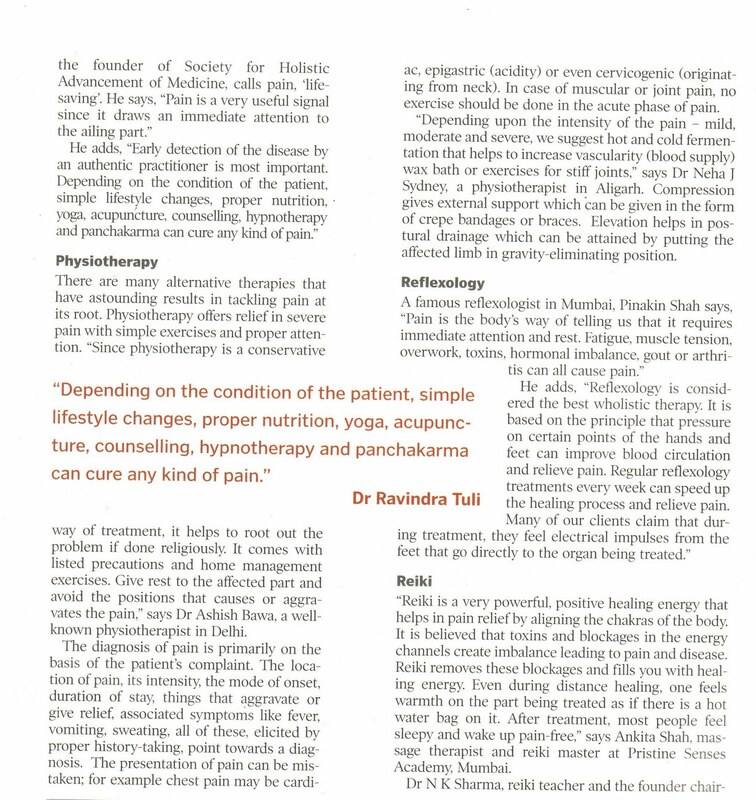 We cannot live a completely ideal lifestyle in this day and age but alternative therapies on a regular basis can help prevent permanent blockages in meridians. 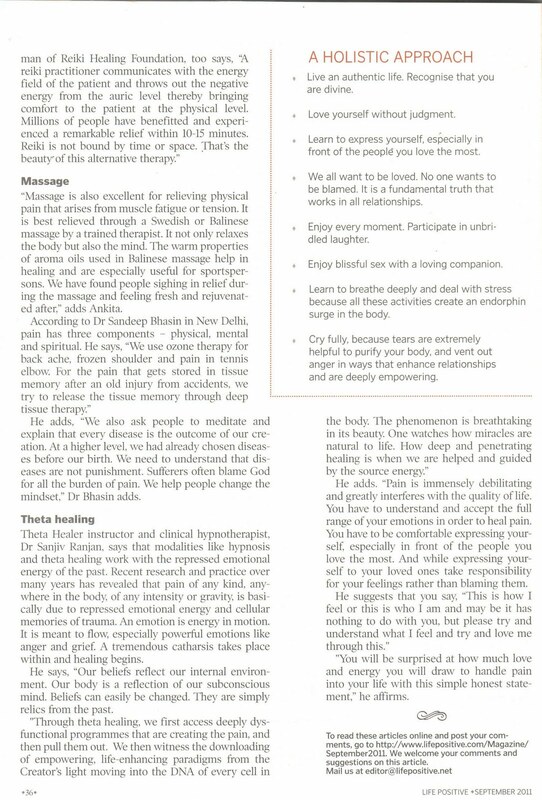 This is how these therapies can help heal a person or prevent diseases. It is simple logic that our ancestors understood years ago and have passed on to us. The solution is in our hands. We just need to choose it.